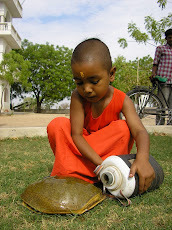 This year the school celebrated Independence Day with Swamiji in the Ashram's garden area. It was a beautiful setting on a winter's day. 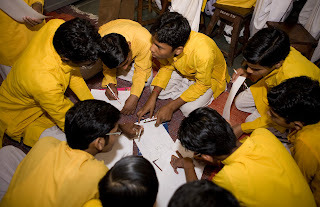 Preparations had been going on for weeks with the students preparing dramas, dances, speeches, bhajans, patriotic songs, pyramids, march pasts, yoga displays and a comedy. There was even a special camel race with the students dressing themselves up as camels. It was a beautiful function full of emotion, passion and humour which was topped off by Swamiji giving a beautiful discourse about Indian culture and the importance of the youth maintaining their contact with the wonderful heritage of India. In December the school played host to a wedding of epic proportions. In order to let the poorer members of their community get married in style the "Soni Samaj" (goldsmith community) of Pali got together and organised a group wedding for people from all over India. There were 22 couples married on the day and they all had gifts donated by the community (for everyone of them exactly the same- ie if you wanted to give something you had to give 22 pieces). The wealthy members of the community paid for the eating expenses and for the arrangements such as the elephants which brought the brides to the wedding area. All in all the heroes pictured from the kitchen produced 16000 meals for the guests which each had at least 10 different items (that is a lot of work!! especially in a kitchen put up in a tent in the middle of our fields). At the height of the function there was probably about 10000 people there at one time. It was...........epic. More photos will be put up in an album onto the net if people want to see, these are just a sample. 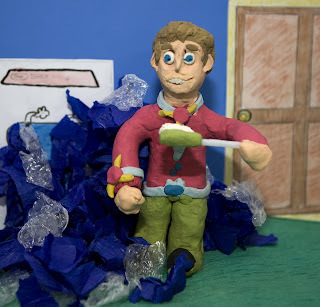 In the last phase of production of the animations the filming and editing was done, all coming together to make 4 short animations of 3-5 minutes each. The process of preparation nears completion and preparations for filming the scenes were undertaken. Then it was time to look to the results on the computer. After the planning and storyboards it was time to create the plasticine characters and to put the sets together ready for filming. Meanwhile others were working on the scripts and the audio. Sorry that the sequence is upside down on the blog i can't figure out how to move the blogs around. For one week the team from Twin Vision was here in Jadan teaching our students how to do animation. It was an intense week. 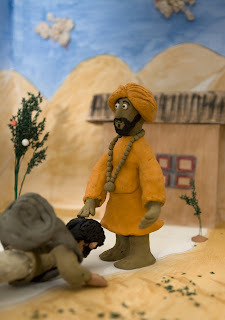 The students were involved in everything from planning the story, making the script, painting and constructing the background sets, making the plasticine models which were the characters in the story and then shooting and editing the animation. It was an absolutely wonderful week culminating in a function where the students showed their work to the rest of the school. Amazing stuff and thanks to the Twin Vision team for giving our students such a wonderful opportunity. If you want to know more about Twin Vision their address is www.twinvisionphoto.co.uk . 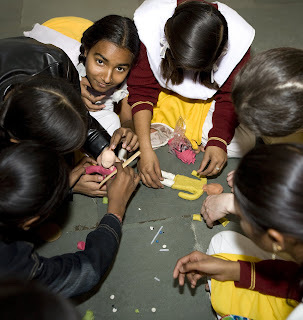 They do projects in countries throughout the world and I can only say if you are a teacher and you get the chance to pull them to your school - DO IT!! Teachers enjoy the project as much and the students! The photos in this blog show the initial stages of planning the script, making the layouts, storyboards and then the sets. In a few days the animations will be up on the internet. Stay tuned. I know it is not the greatest photo of Swamiji that has been taken however the circumstances of the moment make it significant for me. At that moment I was sitting on a chariot with Swamiji as He was being welcomed to a small village in the south of Rajasthan. Having some time to spare I thought I would try and take a photo of Him with a mobile phone and put it onto the blog. To my wonder within two minutes the photo was there to see on the blog via an EDGE signal (how they had that signal in that village i really don't know) !! Perhaps that is normal for some people but here in Jadan we only need to take our memories back 10 years to reach a stage where we had to drive 20 kilometres in order to make an international call or a fax!! It is only four years since we could reliably use email and even then for messages less than 200kb! Times have changed in India, very fast indeed. The logistics of maintaining this blog from Jadan would have been impossible only 1 year ago. In the beginning I used to only update it when visiting to Jaipur. Now......from the mobile phone. 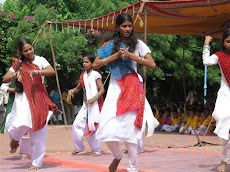 Our College students have been having culture week. Part of the program is making these decorations out of coloured powder. These two girls won for their design which was really beautiful. 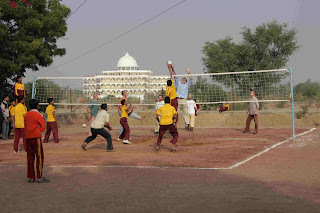 Today Swamiji organised a volleyball match between our hostel boys and a team from our visitors from throughout the world. It was a pretty good match and in the end to much excitement the hostel boys won in four sets. Yesterday we had a small function in school to celebrate a great story. Thomas is a 12 year old boy from Austria who decided he wanted to help the school. He collects chestnuts and then sells them by the roadside. 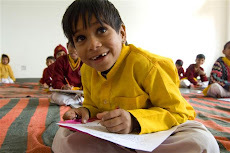 The money that he collects is used to sponsor students in our school under the Gyan Putra scheme. As if that wasn't enough Thomas got his family together and they decided that instead of giving Christmas presents that the money they would spend on each others gifts they would donate to the school. Incredible. Such acts are just inspiring. It was a wet eye day for me when I was telling the assembly about Thomas' efforts. The pictures are of Thomas and his family and some of the 417 students who are sponsored for their studies under the Gyan Putra scheme. 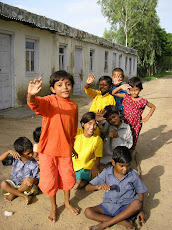 Under the scheme students are given free education, books and uniforms. 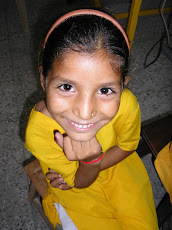 All of the girls studying in our school are in the Gyan Putra scheme as are boys who are unable to pay the nominal fees that are charged in school. Thanks to Thomas, his family and everyone around the world with equally inspiring stories. If the future generation's all think like Thomas we are in good hands. Welcome to the New Year. School has started again here after a short winter “break”. The inverted commas are because our students went on a tour for five days taking in the sights of Ajmer, Pushkar, Jaipur and Agra. They were pretty excited to have seen the Taj Mahal and the big cities of Jaipur and Agra. 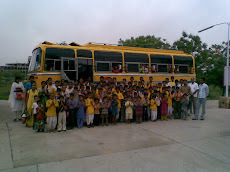 All in all it was a super adventure with 140 students and 10 teachers setting out in 3 buses. We sent cooks and cooking equipment with so that they could prepare meals at any moment. It was a lot of fun and they all arrived back in Jadan exhausted but extremely satisfied. For a lot of students it is their first time away from home and definitely their first time so far away from home ( Agra is 700 kilometres from here). The next weeks will be busy in school. 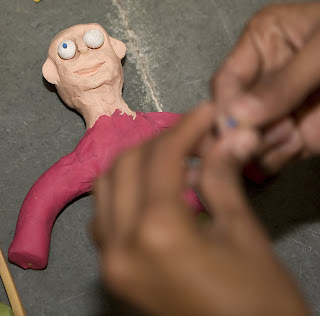 The Twin Vision team is coming from England to give a project on animation with clay models. 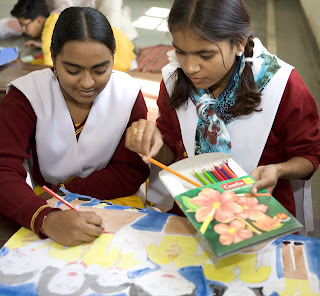 At the end of their program we will have a celebration day with an art competition for all of the school students and also have the students of the Jodhpur school for the Deaf and Dumb as guests for the day. 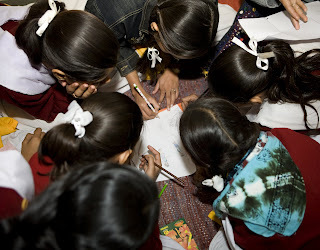 The Twin Vision team is also doing a project with the Jodhpur students before they come here. The inspiration for the art competition mentioned above is from a Hindi movie called “Tare Jamin Par” – which translates as Stars on the Earth. It is a beautiful movie about dyslexia which, if you can get it with a translation is really worth seeing. A tears of joy movie. Then the 26th January is India’s national day and we will have a large celebration with parades, yoga demonstrations, plays, singing, dancing and speeches from the students. Swamiji Maharaj will be here and giving His blessings to all the students which is always a cause for excitement for them. 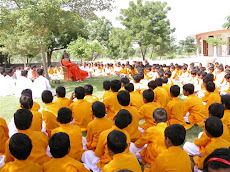 Swamiji has an amazing way of conveying His message to the students by having them constantly laughing and enjoying. The building works are also going on at full speed. At the rate that the work is going on it could be finished by April but………… we don’t actually have funding to pay for the work to go on! If anybody has any ideas of how to help with funding for the building they are most welcome to put them forward. If you know anyone who would be interested in being part of this special experience please let them know. As January goes on the students will start to get serious as the yearly examinations rapidly approach. The first exams will be for 10th and 12th class in March and early April. They are just getting the results of their half yearly exams which were quite good. There is an air of confidence and excitement about their preparation. In general they will all finish their courses by the end of January and then revise and have practice examinations during February. Wishing everyone a happy new year and all the best for the year ahead. May there be peace in the world and in everyone's hearts and .........................enjoy!